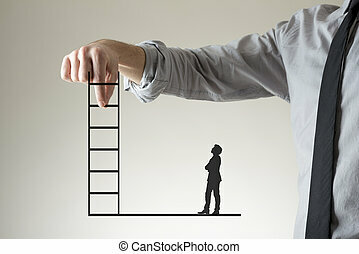 Climbing the corporate ladder to success and promotion concept with a businessman holding up a ladder between his fingers as a small silhouette of a second executive stands watching below. 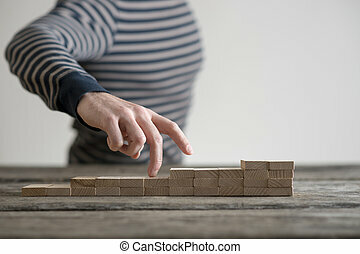 A number of blocks laid out on a table of gradually increasing height with the fingers of a hand tracing out the ascent. 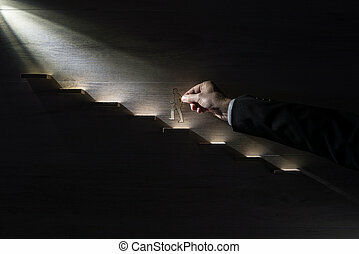 Metaphor for business along the 'staircase' proceeding to a successful future. 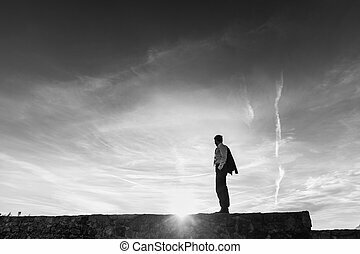 Monochrome image of business man celebrating his success by standing on the skyline on a wall against the sunrise with copy space. 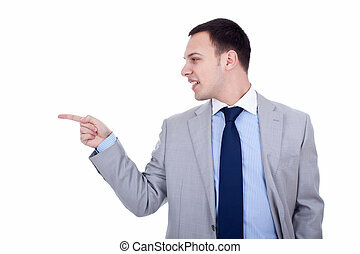 Man listening to the heartbeat of his unborn child with his head and ear pressed close against the swollen pregnant belly of his wife, side view looking away. 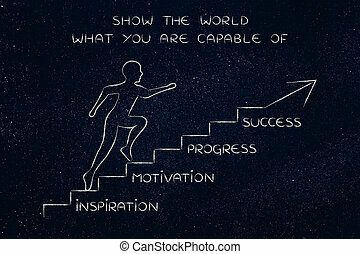 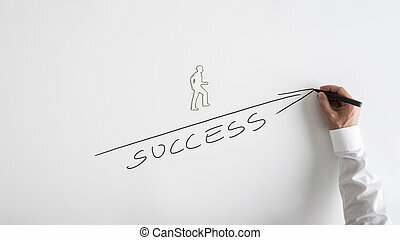 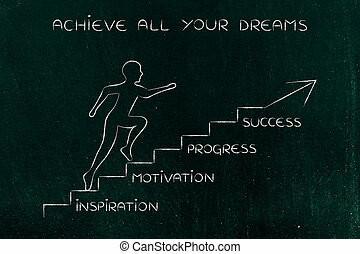 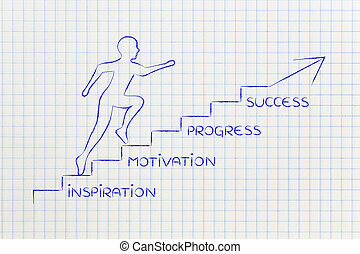 Man drawing the outline of a businessman climbing steps of stacked wooden blocks with a marker pen conceptual of ambition, success, achievement and career advancement. 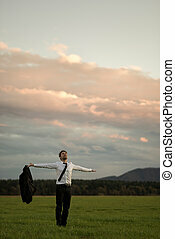 Thankful Young Businessman Standing in the Green Field and Raising his Arm While Looking Up the Sky for Success. 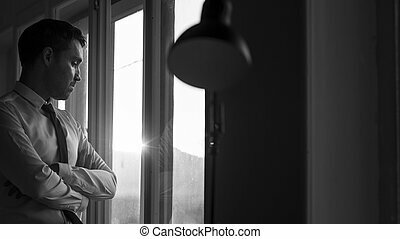 Monochrome image of a young business man wearing white shirt and black tie while thinking and looking through the window at sunset. 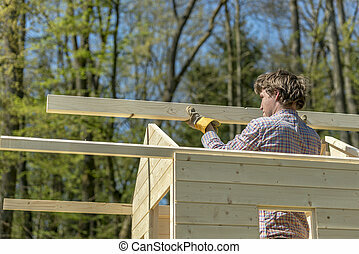 Young man placing the main wooden beam to assemble a roof of a wooden playhouse outside in nature in a DIY concept. 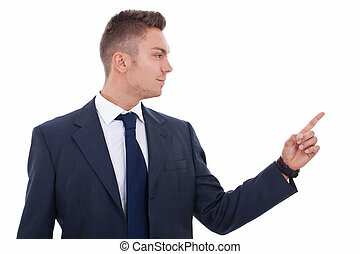 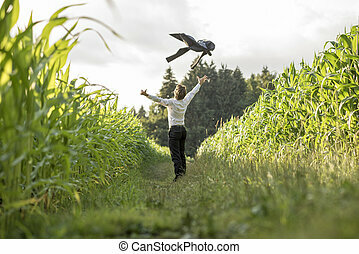 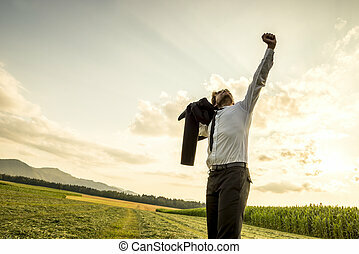 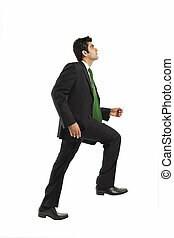 Young businessman celebrating his business freedom and success by throwing his suit jacket in the air standing in grassland between two cornfields. 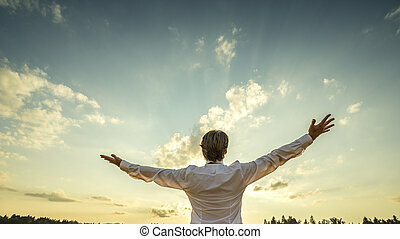 Successful man in elegant white shirt standing with his back to the camera with his arm spread widely towards beautiful majestic evening sky as he celebrates his success and prosperity. 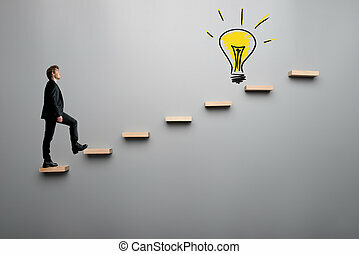 Young ambitious businessman climbing wooden steps towards yellow hand drawn light bulb. 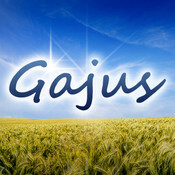 Over grey background. 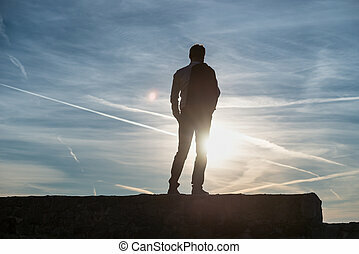 Man standing on the skyline on a wall silhouetted against the setting sun with contrails and copy space. 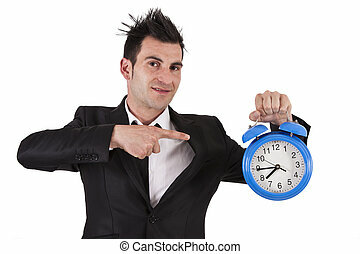 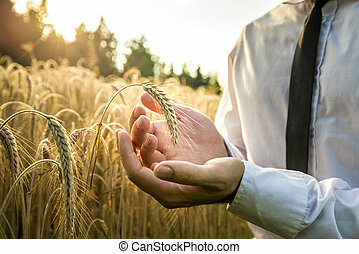 Business man cupping a ripe ear of wheat in a conceptual image for business inspiration vision or success. 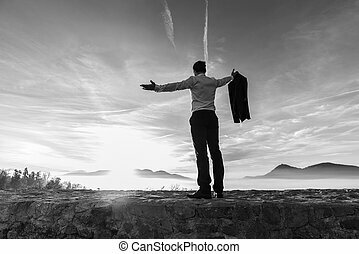 Monochrome image of successful business man at sunrise standing against the bright glow of the sun with outstretched arms, rear view. 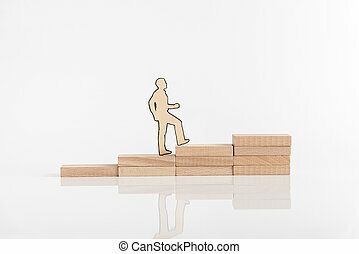 Cut outs of paper man climbing the steps to success in a conceptual image. 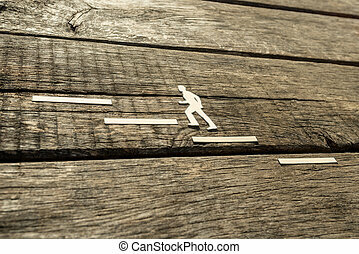 Cut outs of paper man climbing the steps to success in a conceptual image, toned retro effect. 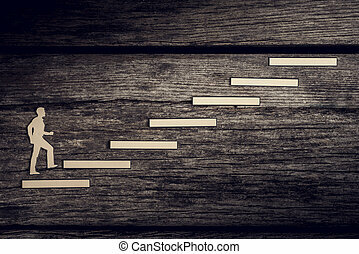 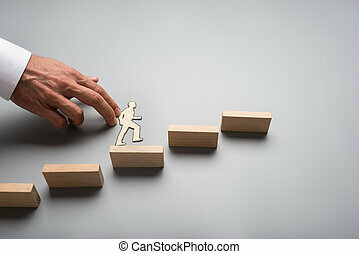 Businessman climbing the steps to success in a conceptual image with paper silhouette cutouts of a man and a human hand helping him climb over rustic wood with copy space. 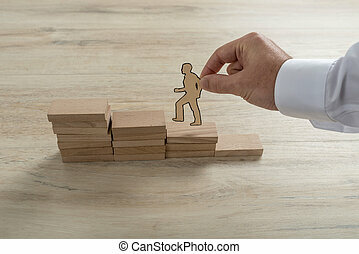 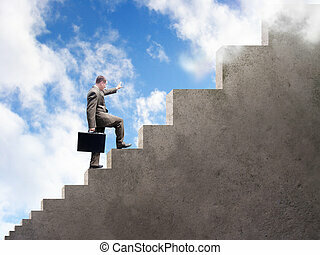 Businessman climbing the steps to success with paper silhouette cutouts of a man and a human hand helping him climb. 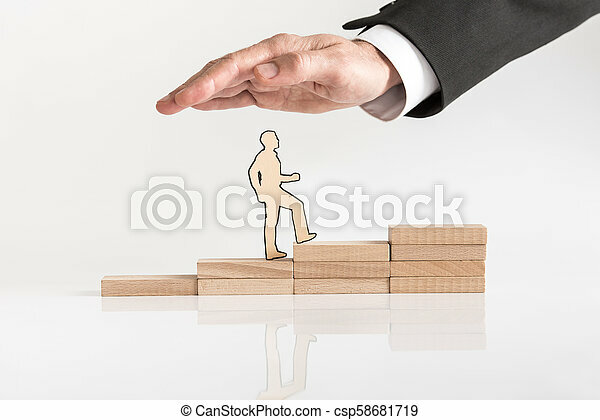 Businessman climbing the steps to success with paper silhouette cutouts of a man and a human hand helping him climb towards the light. 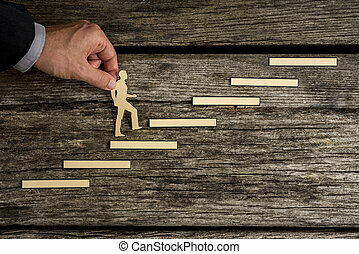 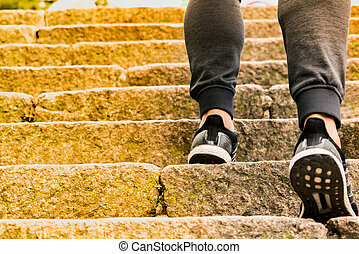 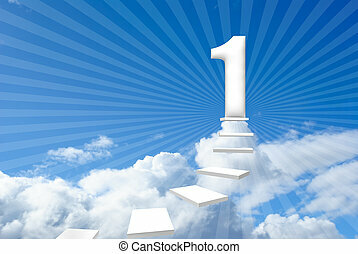 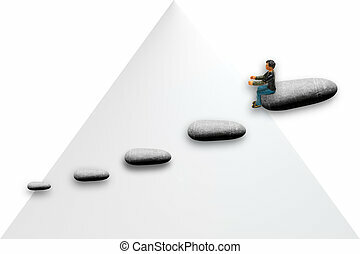 Businessman climbing up the steps to success and advancement in a conceptual image with paper silhouette cutout of a man and a male hand helping him climb over wooden steps. 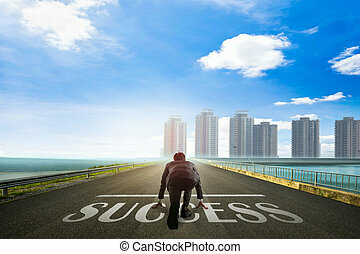 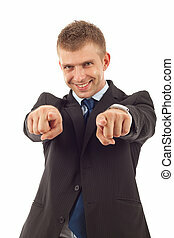 Conceptual close-up of the hand of a businessman drawing on white board a man climbing on the way to success. 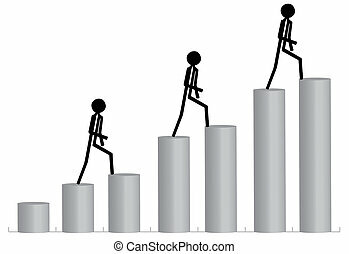 Climbing the corporate ladder to success concept with two businesspeople helping paper cutout of a businessman walking up in a panorama view. 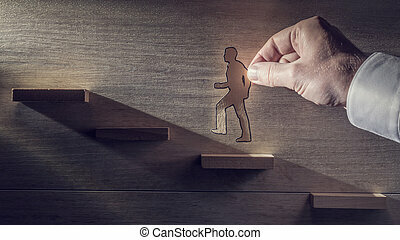 Retro toned image of a business man climbing steps towards the light using paper cutouts. 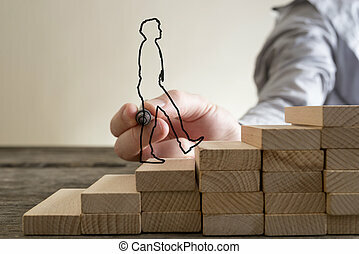 Wide panorama retro toned image of businessman climbing the steps to success in a conceptual image with paper silhouette cutouts of a man and a human hand. 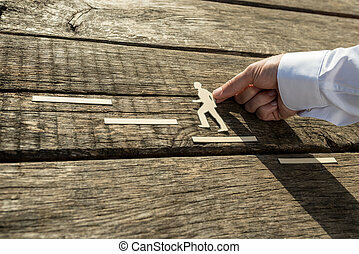 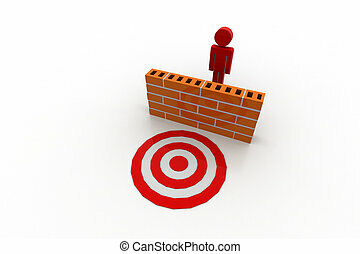 Businessman using cutouts of paper man climbing steps with reading words that represent important elements in business and compass. 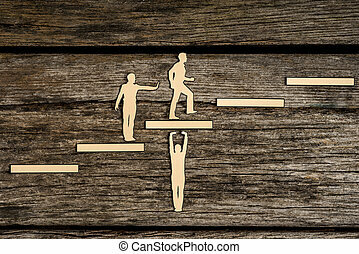 Steps to success in a conceptual image with paper silhouette cutouts of a man and a human hand helping him climb over rustic wood. 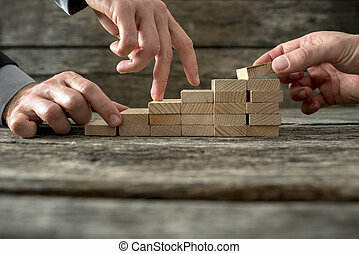 Team effort on the way to success - two male hands building stable steps with wooden pegs for the third one to walk his fingers up towards personal and career growth.